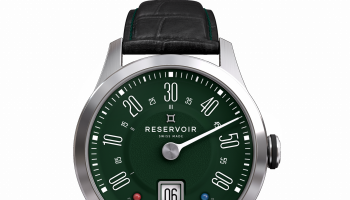 Reservoir is little more than a year old as a watchmaker, but the Paris-based business made a significant impact at this year’s Baselworld with its collection of timepieces inspired by the functionality and the aesthetics of vintage measuring instruments. The company is the brainchild of Francois Moreau, who made his fortune managing the finances of the ultra rich as a C-level executive at HSBC bank in Japan, Hong Kong and eventually his native France. He must have rubbed shoulders with plenty of seasoned watch collectors in that time, and told WatchPro at Baselworld that he developed his own passion for haute horology over the years. When he quit the banking rat race in 2015, he decided that he would rather be making watches than simply buying and collecting them, and assembled a team of designers and watchmakers that could bring his dream to life. Along with a love of watches, Mr Moreau also adores the design, engineering and history of industrial machinery and, obscurely, has a particular passion for the measuring instruments that are such an essential part of mechanics found in aircraft, cars and even submarines. 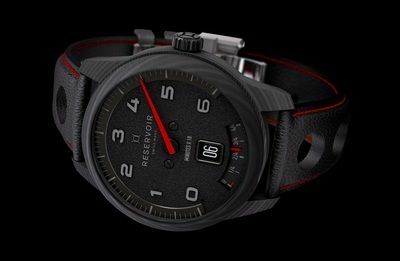 These industrial instruments informed the fundamental design of Reservoir’s watches, which have retrograde minute hands that looks like the needle of a car’s speedometer, an airplane’s altimeter or a submarine’s pressure gauge. They all have a jumping hour indicator at 6 o’clock, which might be mistaken for a car speedo’s mileage counter, and a power reserve indicator below the jumping hour that looks just like an old fashion fuel gauge. 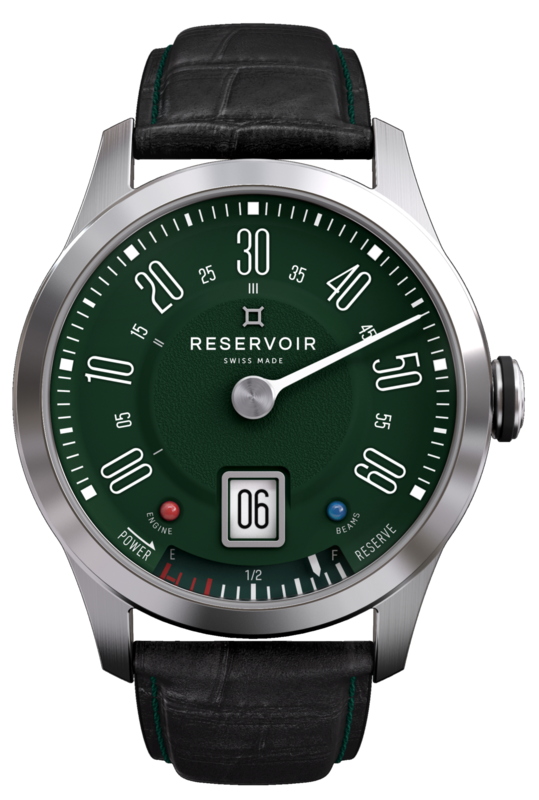 The 2017 collection from Reservoir was the company’s first, and WatchPro was already intrigued, but in 2018 the concept truly hit the bullseye with the release of the Longbridge, a watch designed to look like the speedometer of the classic Minis that rolled off the production line of the Birmingham car maker in the 1960s. The watch comes in a ladies’ and men’s versions, and it is the British racing green dialed model that WatchPro most admires and spent time with for this review. The dark green immediately says motoring, and the black croc leather strap with green stitching is a perfect shade and style to complement the look. So many details on the dial link back to the Mini, including the font of the hour markers, the indent at the centre and the shape of the minute hand. 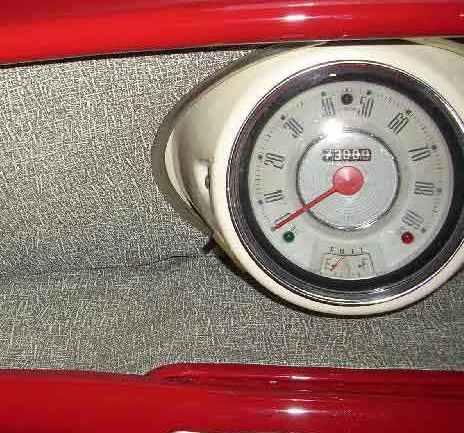 There are even tiny red and blue dots labelled as engine and beams diodes; an ultimate homage to the original indicators of the Mini. Reservoir has taken no chances on the mechanics of the Longbridge, powering the piece with a modified Swiss-made ETA 2824-2 movement that operates the retrograde minute hand, jumping hour and 37-hour power reserve. 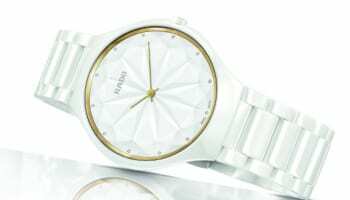 The 39mm steel case is sharp and angular with a mixture of polished and unpolished surfaces. The screw-in crown is stamped with Reservoir’s four-sided logo. The winder connects to a special clutch in the movement that protects it when the time is being adjusted, and prevents any damage to the retrograde mechanism as you wind through the hours. The detail and finish are impressive for such a striking £3500 talking piece of a watch and it is a delight to wear. 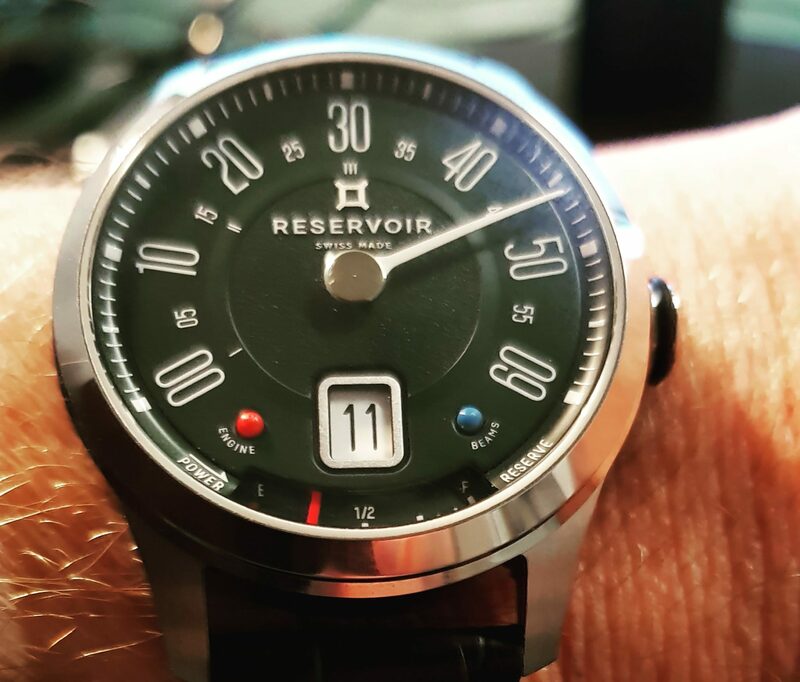 The 39mm size is smaller than all other Reservoir men’s watches, but I would encourage the watchmaker to adopt it more widely across its collections because it feels more modern than the larger models. 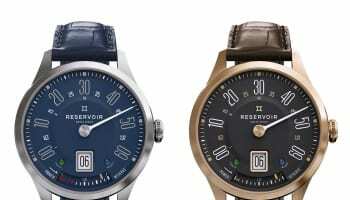 Two prestigious retailers have already committed to stocking Reservoir watches in the UK, perhaps attracted to the British styling of models like the Longbridge. 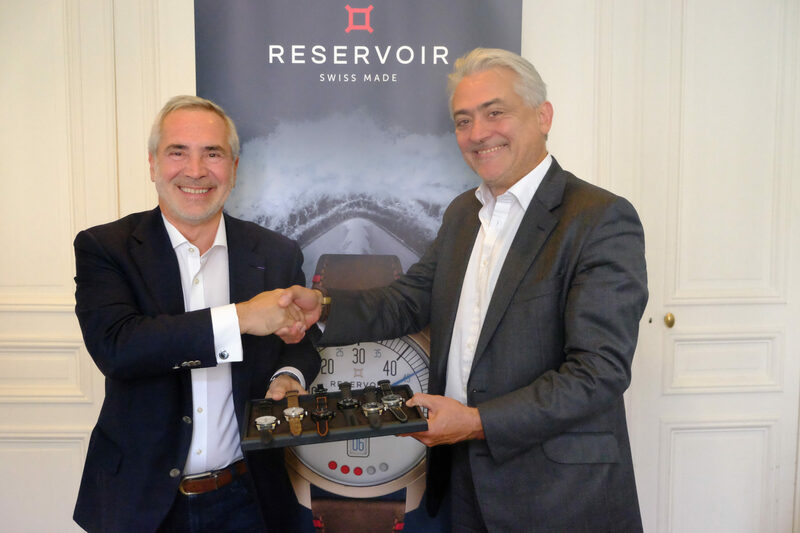 The stature of these partners, which WatchPro will reveal in the coming weeks, will surprise many of their peers, and will likely nudge several other buyers to consider the brand. That would be well-earned success for a start-up brand that has genuinely created a different, instantly recognisable style that we feel will find a significant customer base in this country, especially those who remember their first car was a Mini. The green dial indeed looks so satisfying. The lights and beams seems to be the latest features for me. I’ve never seen such functions before. How good is it compared to Rolex or Omega? You can’t really compare it to Rolex or Omega from a brand recognition or pure watchmaking point of view. It is the sort of watch that you love for its design and link to a classic British car, but it is beautifully made as well, with a reliable Swiss movement.